If you want to earn cash for your scrap metal or recycling materials, come to Mid-City Scrap Iron & Salvage in Westport, MA. It can be somewhat overwhelming on your first visit facility is bustling with large trucks and vehicles, equipment and lots of people coming and going. But once you know how it all works you’ll find that it’s a very simple process. 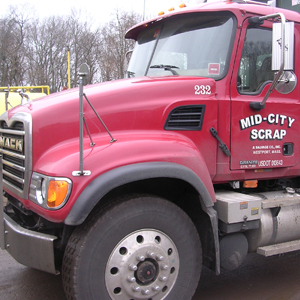 Step #1 – Bring your materials to Mid-City Scrap Iron & Salvage Co.,Inc. located at 548 State Road in Westport, Massachusetts. Step #2 – SLOWLY drive onto our State Certified truck and vehicle scale to be weighed in – stay inside your vehicle. Step #3 – Show your State-issued Photo ID to our Scale Operators, receive a scale weight ticket with a barcode (this will have information on the materials you have and how much you weigh upon entering the scale including passengers and the vehicle weight. When directed drive off the scale and drive to unload your materials where directed. Step #4 – After unloading. Return to the scale to weigh out – stay inside your vehicle. Step #5 – Give your weight ticket to the Scale Operator and wait for it to be processed and returned. When directed drive off scale and park your vehicle. Step #6 – Exit your vehicle and walk into the Scale Office to receive payment. Step #7 – Give your weight ticket to the Scale Operator inside and wait for your paperwork to be processed. Step #8 – Receive your final weight ticket, scan the ticket with the barcode and receive your payment via a secure ATM inside the Scale Office.